Kelso square after renovation work. Five years of improvements costing £1.4million officially ends in Kelso this week with the conclusion of its Townscape Heritage Initiative. And to mark the completion of the project, which has transformed the centre of Kelso, there will be a special three-day exhibition as the final part of the ‘Discover Kelso’ education element of the Kelso Townscape Heritage Initiative (THi). The exhibition will be open to the public from tomorrow until Sunday, 10am to 4pm, and is being held upstairs in the Town House in Kelso Square. It will showcase features such as the major building repairs to key properties, the new infill building and the streetscape works. A selection of creative work from ‘Discover Kelso’ will also be on display. 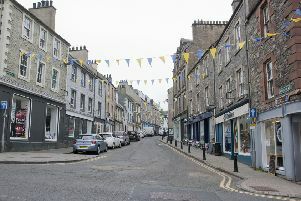 The Kelso THi was funded by the Heritage Lottery Fund, Historic Scotland and Scottish Borders Council, and began back in April 2010, aiming to assist the community with the regeneration of the historic centre of the town. This was achieved through the provision of grant funding to eligible properties for external fabric repairs totalling over £650,000, as well as complimentary initiatives such as supporting the upgrading of the public realm with high- quality natural materials, and providing opportunities in heritage education and skills training. Kelso THi also contributed to Horsemarket Business Centre which opened last year. Colin Gilmour, Project Officer for Kelso THi, said it had been a fantastic scheme that has safeguarded many important buildings and the iconic cobbled square. “This exhibition is an opp ortunity to see the positive impact Kelso THi has made and we would encourage townsfolk to come along and see how much work has been achieved by the community since April 2010,” added Mr Gilmour. Local community councillor, Harry Tomcyzk, represented the council on the stakeholders’ group that oversaw the project and which was chaired by former Kelso High School rector, Charlie Robertson. Mr Tomcyzk says Kelso has what is widely recognised as the most beautiful town square in the country. “Over the years it has seen many changes and changing needs. Now we have a square which is fit for the 21st century, but still reflecting the heritage of the town,” he told us. “I would like to compliment the many SBC people involved on the work they have done and their helpful approach. “I would also to thank the many people in Kelso who have been actively involved, particularly owners of property in the square and those on the stakeholders group involved in planning of the public realm works over the five years”.